Who would’ve thought that the World Cup would have such a deep impact for 32 days on a Nation. Who had the USA making it out of their group? Who had Spain and Portugal not making it out of their group? Who had Costa Rica making it to the quarterfinals? Not me, and probably none of you. You see, that’s what great about the World Cup. It can inspire a Nation. And it did. Not only the hype, not the controversy surrounding riots and stadiums not being built in time, but the team. And it wasn’t the fact that we were underdogs. It’s how we played, it’s how we won games. Massive viewing parties at bars, arenas, downtown plazas like in Kansas City and Detroit. And unfortunately, it came to a end to soon. The USA lost to Belgium 2-1 in the Round of 16. In what was a heart breaker, it still inspired a meme that included Goalkeeper Tim Howard, who recorded 16 saves in that game. It was quite a ride, and now, the Country looks forward to next year (Yup, 2015 Women’s World Cup). I said back in May, when excitement was rising, when it was a discussion during class or PE. Watch out, Germany is good. I had them in the Semi’s, but I didn’t expect (no one did) what they did to Brazil. That was stunning. It was embarrassing for Brazil, the host country, and the favorite, to go out like that, and then lose in the 3rd place match. More on that later. Germany was in USA’s group, and they advanced with the USA to the Knockout stage. Going through Algeria and France in Full Time, and then destroying Brazil in the Semi’s. I was really hoping that the Final wouldn’t go PK’s. A game with so much at stake doesn’t deserve that, and neither do the fans. But when Mario Gotze scored the game-winning goal at the 113th minute, Argentina’s fans who came from across the Continent of South America, were shocked and disappointed. Messi had carried the team through Switzerland and Belgium and was looking to get Argentina’s 3rd World Cup since Diego Maradona in 1986. However, Argentina, who was preparing for penalty kicks, gave up the game-winner, in a thriller 2nd half of extra time. Germany’s run will go down as a complete team effort, everyone contributed to their dominate performance. When Brazil went down 3-0 to Germany at the 24th minute in the Semifinal, the boos started, Brazilians were let down by their team, who were the favorites in the beginning. The teams star, Neymar, had been injured in the previous game and was out for the rest of the Cup. He had addressed Brazil as a country in a TV interview, trusting his team that they would win. 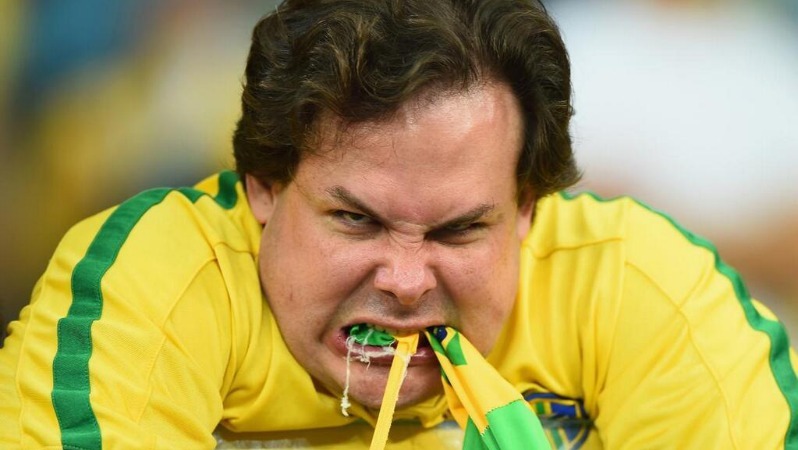 It didn’t seem unreasonable, but it was a challenge, with himself out and Thiago Silva suspended, Brazil’s chances slipped, and instead of a heartbreaking loss, the team collapsed, completely. Brazil lost 7-1. One of the worst defeats in history, and the worst defeat in World Cup Semifinal history, it’s not even worth talking about. The World Cup couldn’t of been more patriotic for the USA. The USMNT inspired the Nation, beating the odds, scoring game-winners, it couldn’t of been more fun, and hopefully, it’ll be even better in 2018.